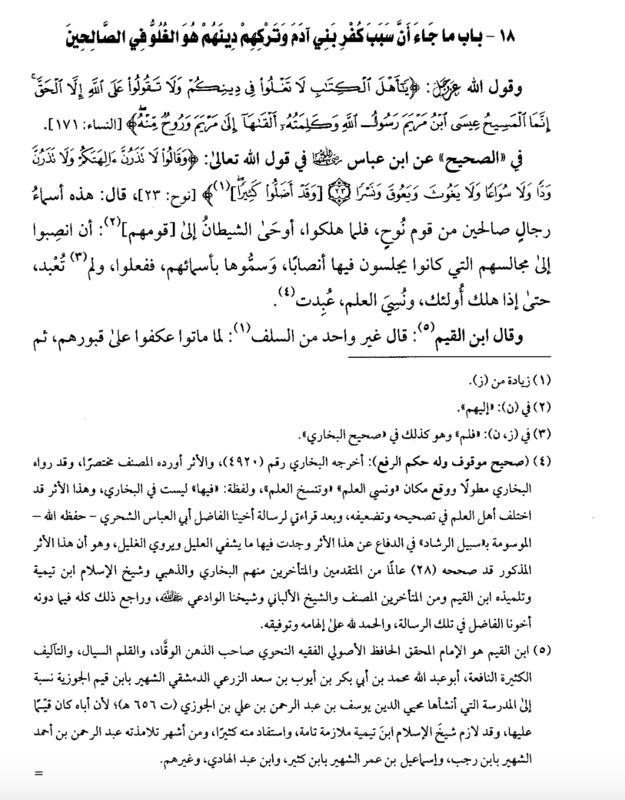 Chapter 19: What is said concerning the reason for the disbelief of the Children of Adam: It was their abandonment of the Religion and that was by them going to extremes in the veneration of the pious folk. Allaah’s Messenger (salallaahu `alaihi wassallam) said: “Be warned from exaggeration for indeed those who came before you were destroyed due to exaggeration.” (Reported by Ibn Maajah, no. 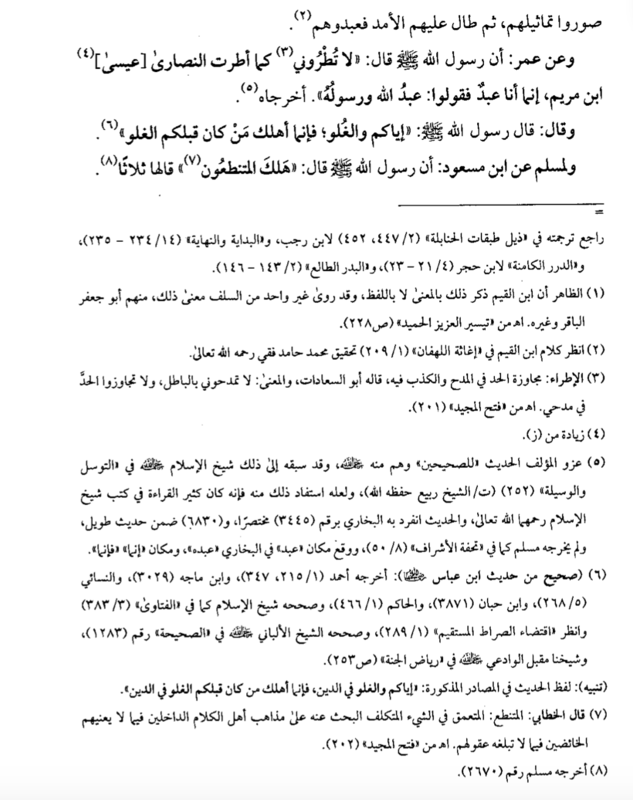 3029 from the hadeeth of Ibn `Abbaas (radiyallaahu `anhumaa) and authenticated by Al-Albaanee in Saheeh Ibn Maajah, no. 2455). Muslim reported from Ibn Mas’ood that Allaah’s Messenger (salallaahu `alaihi wassallam) said: “Destroyed are those who go to extremes.” and he repeated it three times. (Reported by Muslim, no. 2670). Ghuluww (exaggeration): It is to increase in something beyond what it deserves. Allaah forbade the People of the Book from exaggeration and going beyond bounds. They went to extremes and entered into matters with extremism which they were not permitted to enter into. The Christians went to extremes with Jesus the son of Mary (`alaihis-salaam) and made him into a deity, or they made him a son of Allaah. 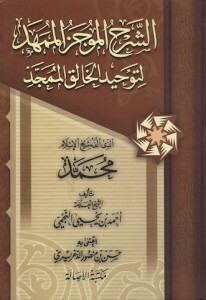 The Jews went to extremes concerning `Uzayr until they made him a son of Allaah. So Allaah prohibited them from ghuluww (extremism): يَا أَهْلَ الْكِتَابِ لَا تَغْلُوا فِي دِينِكُمْ وَلَا تَقُولُوا عَلَى اللَّهِ إِلَّا الْحَقَّ ۚ : “O people of the Scripture (Jews and Christians)! Do not exceed the limits in your religion, nor say of Allah aught but the truth.” And the ‘truth’ is that the bounds are not to be exceeded to the point of divinity and worship – so it is not permitted to say regarding anyone that he is the son of Allaah. The tribulation that afflicted the children of Adam and that which led them to enter into Shirk was due to exaggeration [with respect to the pious people]. That Shaytaan enters by trickery and deception until he takes them into steps that will lead them to Shirk. So he commanded them by goading them to make images of those righteous men – but he did not command them with the worship of those images to begin with. Shaitaan does not care how long it takes. It took a long time before those statues and images were worshipped. So he commanded them [initially] to erect those statues and images in their gathering places. Then he came with a another deception. So in the first deception he said to them: “If you erect statues and images of them, you will be reminded of what they used to say to you, and that will encourage you to worship.” Then in the second deception, he said to them: “Your forefathers would seek rain from these men, so they would seek rain.” So the people went ahead and did that until the first generation came to an end, and then there came a new generation. He said to them: “Your forefathers used to worship them.” So they started worshipped them. And this is the way that Shaytaan descends upon the people step-by-step until they fall in to Shirk with Allaah. Then Shaytaan revived the memory of these men after the flood and the destruction of the people of Nooh (`alaihis-salaam) – so he revived the memory of these men. And when the Prophet (salallaahu `alaihi wassallam) was sent in his time (many thousands of years later), these men were still being worshipped as is clear from the narrations. “…let him work righteousness…” The righteous deed is that which is done sincerely for Allaah, and it agrees with that which was brought by the Prophet (salallaahu `alaihi wassallam) without exaggeration and without falling short. So exceeding the bounds is not permitted and likewise falling short is not allowed. And it may be the case that the harm incurred by negligence is less than that which is incurred by exaggeration because going overboard in veneration and praise of created beings takes the thing being praised beyond the limits. And going beyond the limits makes the creation an object of worship. As for his saying: “Be warned from exaggeration for indeed those who came before you were destroyed due to exaggeration.” This shows the danger of exaggeration. And it is obligatory upon the people to fear Allaah (the Mighty and Majestic) and to act in accordance to what they have been commanded with without going to excess and without falling short. Then the final hadeeth narrated by Ibn Mas`ood that Allaah’s Messenger (salallaahi `alaihi wassallam) said: “Destroyed are those who go to extremes.” He said it three times. And At-Tanattu` is severity, harshness and being burdensome in that which is not allowed. So it is obligatory to be balanced in affairs (Al-Iqtisaad) not increasing, just as it is not allowed to fall short in affairs by not giving them their due right – and likewise one does not exceed the due right.